Using the right flux is critical. 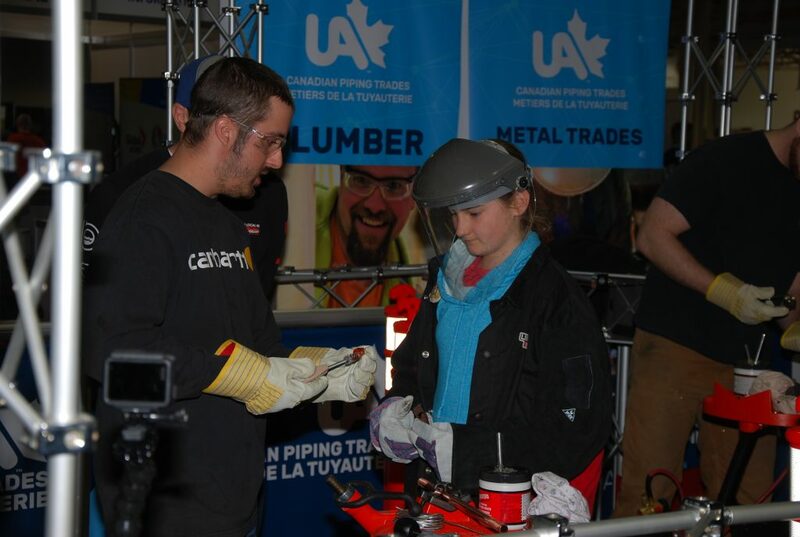 UA tradesmen taught visiting high school students how to join copper at a Skills Ontario event a while back. Several months may elapse between the commissioning of the plumbing system and the start of occupancy in a new building. Research from around the world shows that there is a high risk of bacteria growing in water systems during this period of prolonged stagnation. As part of the technical commissioning of a new building of about 13,000 sq. meters (140,000 sq. ft.), many preventive measures were put in place to prevent the deterioration of water quality between the commissioning of the plumbing network and the occupancy of the building. Despite these measures, including frequent purging of water systems, the first water quality control test results revealed a high rate of bacteria at different points in the system. The zinc level was higher at the points of use than at the water inlet. This high level of zinc found in the water samples made it possible to make the link between the deterioration of the water quality and the flux paste used to solder the copper plumbing. Indeed, one of the components of soldering flux is zinc chloride. systems must be certified to ASTM B813. It has been determined that the abnormally high presence of bacteria in the water is associated with the use of petroleum-based paste flux. This type of product does not comply with Section 2.2.9.2. (3) of the National Plumbing Code, which is the basis for provincial codes. It specifies that flux used in soldering copper water systems must conform to ASTM International Standard B813, “Liquid and Paste Fluxes for Soldering of Copper and Copper Alloy Tube.” This standard does not permit fluxes containing petroleum products to be used in the joining of copper tube for potable water systems. Flushing out new copper piping systems is a critical part of building commissioning. Research in the U.S. highlighted the importance of not using petroleum-based flux to avoid significant water quality issues that may persist in the water systems. These products are particularly resistant to flushing with water, resulting in accelerated corrosion of copper pipes and a significant bacterial growth in pipes. This causes copper concentrations in water above prescribed standards (1 mg/L) and bacterial contamination values up to 10,000 times higher than what is normally observed in the water system of a large building. In fact, the presence of ammonia chloride in some fluxes led to an increase in the concentration of ammonia, an element that promotes the growth of nitrifying bacteria in the water and on the pipe wall. 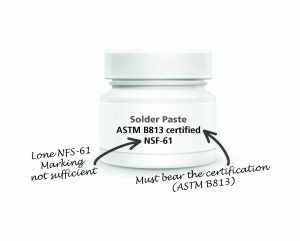 In addition, the hydrophobic (water resistant) nature of the petroleum-based flux makes this type of solder paste very difficult to remove by flushing with cold water, even at high flow rate (≥ 0.91 m/s or 3 ft/sec). Prolonged and repeated flushing with hot water (≥ 60 °C) is necessary to dissolve the residues and dislodge them from the walls of the pipes. However, even these tactics with hot water do not guarantee the complete removal of residues, especially if the system has been stagnant for more than a week. Residues can accumulate in bends, gaps, mixing valves, shower heads and system vents. Flux residues also interfere with chlorine disinfection, rapidly lowering residual chlorine levels and making disinfection of the system ineffective. 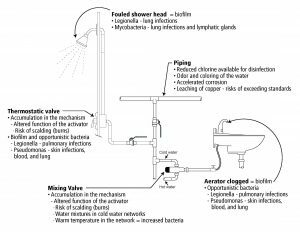 For components of the water supply system, accelerated corrosion, fouling of aerators, showerheads, valve actuators and thermostatic mixers are consequences of the use of a petroleum-based product (See Fig. 1). It is important to use a certified ASTM B813 flux to prevent corrosion and ensure the proper operation of the actuators, and also to limit the proliferation of bacteria and metal drops in plumbing installations. It is also essential not to use too much flux, reducing the surplus that will have to be flushed out. Indeed, even if the correct flux is used in the right amount, debris and excess flux must still be flushed out of the plumbing system prior to use.